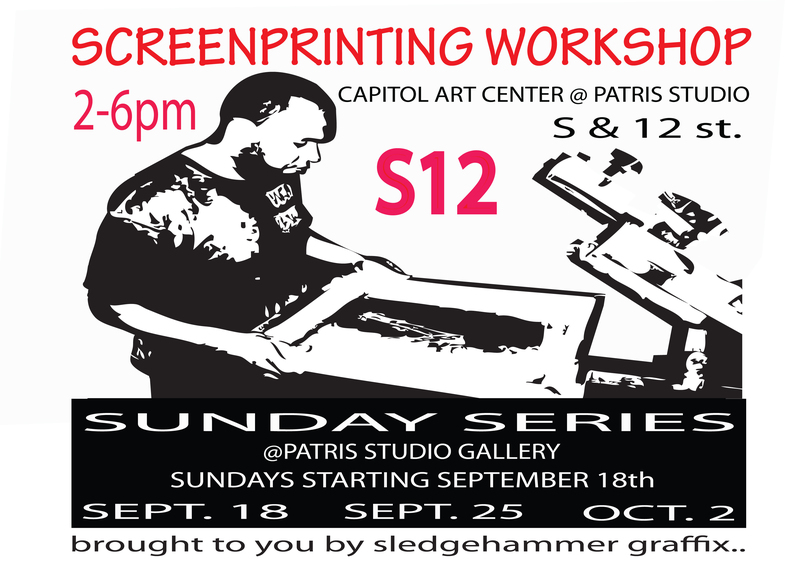 Already in effect on its second Sunday, Sept. 25, SledgeHammer Graffix is offering round two in its gallery-traveling screen printing three-part workshop . Taught by long time screen printer and business-owner, Leon Willis will show you step-by-step how to create a screen printed card or poster, using a one-three color process. The series that began Sunday, Sept. 18 will resume Sunday, Sept. 25 at 2 pm and the last class is Oct. 2. Classes are located at Patris Studio @ S12 Gallery on 1200 S St. The class is taught to those willing to learn that are ages 9-years-old and over. This is perfect for parents and children, couples, business partners, college and high school students and art students. Come join in the fun and take your projects home with you for $20 a class. If Children are under 13-years-old, they pay just $10. This class is a great way to start off your week and to spend some quality time learning a new craft! For more information on workshops, printing goods for your business or one-on-one screen printing classes and internships, visit SledgeHammer Graffix and check us out on Facebook too!